This year, November marks the end of the Extraordinary Jubilee of Mercy. Leah Parker-Turnock spoke to one CAFOD supporter, Judith Tooth, who was inspired by her faith to undertake a pilgrimage along the Camino de Santiago to stand in solidarity with refugees. Judith carried a special cross on her journey – the Lampedusa cross. In 2013, hundreds of refugees who were fleeing Eritrea and Somalia drowned off the coast of Lampedusa. Francesco Tuccio, a carpenter from the small Italian island, was moved to gather the driftwood from the wrecked boats and turn them into crosses. He offered the crosses to survivors as a symbol of their rescue and a sign of hope. The cross was also a powerful symbol for Judith throughout her pilgrimage: “I fixed the 30cm cross to my backpack along with my scallop shell – the symbol of the pilgrim route. Fellow pilgrims were profoundly moved when I explained to them that the carpenter had offered the crosses he’d made to survivors as a symbol of their rescue and a sign of hope, and that I was carrying one of those crosses to continue that message of hope. 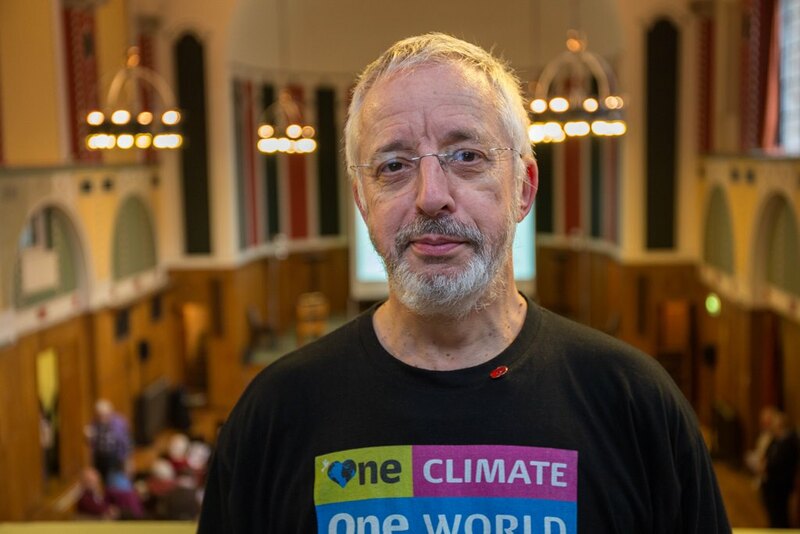 Daniel Hale is CAFOD’s Head of Campaigns. In November, CAFOD will be hosting retreats all around the country, giving supporters a chance to reflect on faith and taking action in light of the Year of Mercy. There are only three more weeks until the end of the Year of Mercy, the holy year called by Pope Francis to reflect on the mercy of God. Of course reflection is good at any time, but why did the Pope ask for this year to be the year? I think it was a clever way to ask us to take a fresh look at the problems faced by the world and its people. The refugee crisis, to which Pope Francis had tried to draw so much attention was one such issue. Over several years Francis had done a lot to promote the cause of refugees, including visiting Lampedusa, where so many migrants washed up on European shores. But the world was slow to act. This week we heard that there are a record 65 million people displaced around the world. The European crisis is mirrored across the planet: in Colombia, in Central America, in the Middle East and many more places, including many of the countries where CAFOD works. Fleeing war, poverty and persecution, people are moving in search of peace and prosperity – a better life for their families. A few find their way to the UK. There are likely to be refugees living in your parish. It can seem like these global issues are far beyond what we as individuals and families can do to help. But in this Year of Mercy, we are reminded that we should welcome the stranger. We’ve already been moved and encouraged by the number of schools, parishes and individuals who are showing solidarity with refugees. In the past fortnight a time machine took me back to the late 1980s. I was sitting watching my favourite tea-time programme: a re-run, in glorious Technicolor, of a McCarthy-era, American sci-fi series. The meek, unsuspecting earthlings were being duped again, by the cold, cunning aliens. More invaders had landed in their town and were taking over. But the only people that could see this were a small boy who kept shouting for people to listen…and me. Sarah Hagger-Holt works in CAFOD’s campaigns team. Every migrant or refugee’s journey begins with ‘what if?’s. What if I never make it? What if I’m turned back? What if I never see my home or my family again? What if where I’m going is worse than where I’ve come from? Yet, it is not just other people who are migrants, travellers, makers of journeys. We all have our own significant journeys, and our own stories of displacement, change or transition. Last week, I spent the day with a group reflecting on Laudato Si’ and on our response. We began by sharing our own stories of journeys made and new turns taken. 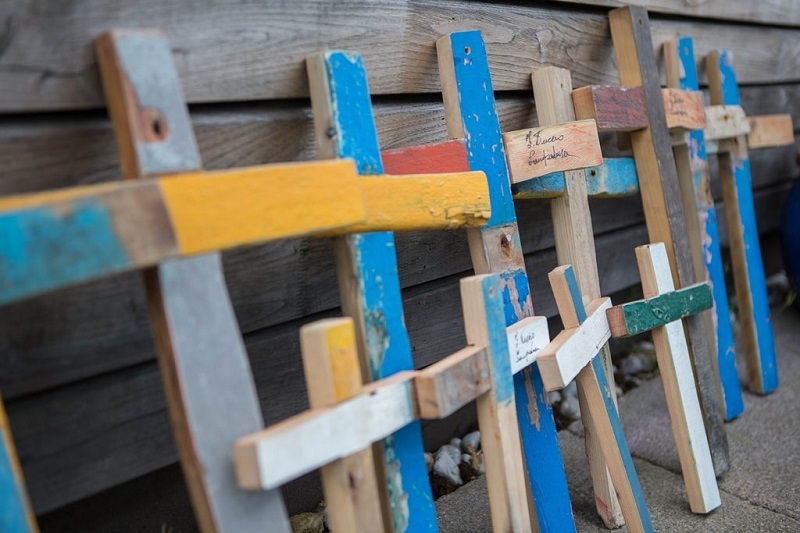 Sicilian carpenter Francesco Tuccio makes rough crosses from the wreckage of boats carrying refugees that sank off the island of Lampedusa to offer to survivors as a symbol of their rescue and a sign of hope. Here, Francesco explains what motivated him to act. In 2009, refugees started landing on the coast of Lampedusa. We, as residents, got to know the people, the victims and their families. I felt angry that no one was caring about so many tragedies and losses. It was a real injustice. We were on the front line to help: to welcome refugees, feed them and treat them with respect. I got the impression that for the media they were second-class citizens not worth of attention, not even worth being mentioned in the papers. I had never witnessed so much suffering in all my life. To see people going through so much pain, seeing mothers losing their children or a husband was very hard. It is difficult to describe how I felt when faced with so many tragedies. So, as a Catholic inspired by the suffering Jesus Christ went through on the cross, I wanted to create crosses to give hope and a better future to those who were suffering so much. This action has been appreciated by so many people. “Hello my name is Kris and I am a CAFOD volunteer”, an opening line that I have used many times in the past, but this time it was very different. Pentecost Sunday 2016 was the third and final day of the weekend pilgrimage to Walsingham by my parish, St Thomas More’s. The day before I had been privileged to serve Mass for Bishop Robert Byrne at the climax of the Archdiocese of Birmingham’s Diocesan day pilgrimage to the shrine. 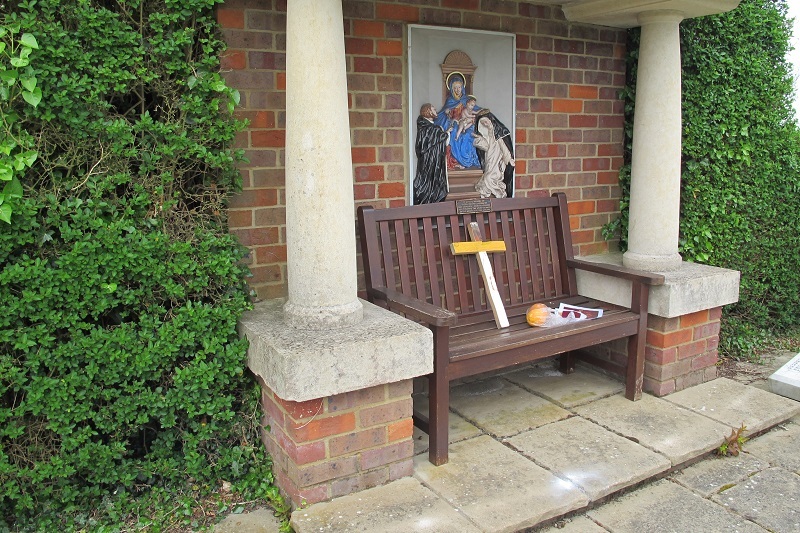 This morning the crowds had gone and as we left Elmham house to walk the pilgrims’ mile down to the shrine. CAFOD, CSAN (Caritas Social Action Network) and JRS UK (Jesuit Refugee Service UK) all work to support refugees and migrants in different ways. Together, we are encouraging the Catholic community to act in welcome, respect and love during this Year of Mercy. In this guest blog, Caroline Grogan from CSAN shares some of what CSAN and JRS are doing to speak out for refugees in the UK. 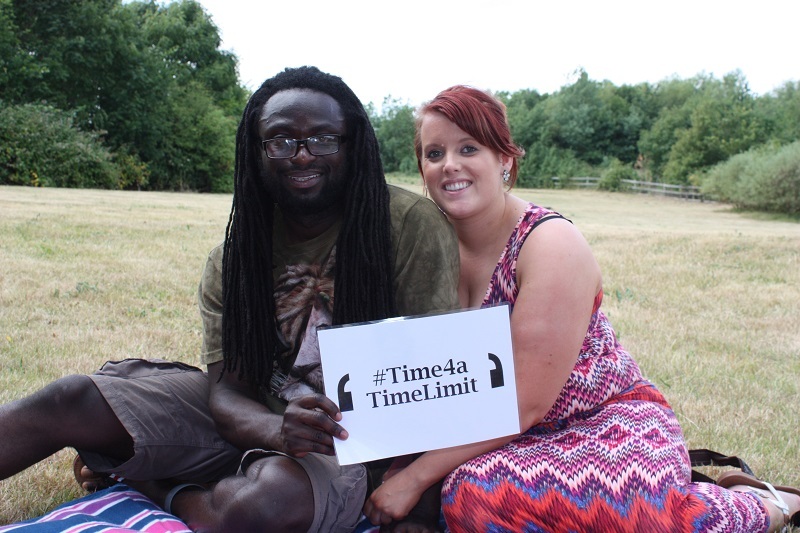 The issue of immigration detention is particularly important to CSAN which works with the Detention Forum, (a network of organisations working together to challenge the UK’s use of detention). Immigration detention is when someone who does not have the legal right to remain in the UK is detained, until a decision is reached about their eligibility to remain in the country or be deported. Inspired by the values of Catholic Social Teaching, the two most fundamental principles for CSAN are Human Dignity and the Common Good. This means that we are all equal in the eyes of God. We share the world and therefore share the responsibility for protecting our brothers and sisters in detention. Tom Hallsworth works with Animate Youth Ministries in St Helen’s in the Liverpool Archdiocese, leading retreat days with young people aged 11-25 to inspire them to live out the Gospel and social justice. He’s part of the CAFOD ambassador scheme, connecting CAFOD with youth centres across the country. I’ve been working hard to help young people to understand the refugee crisis, and see what we can do to help. 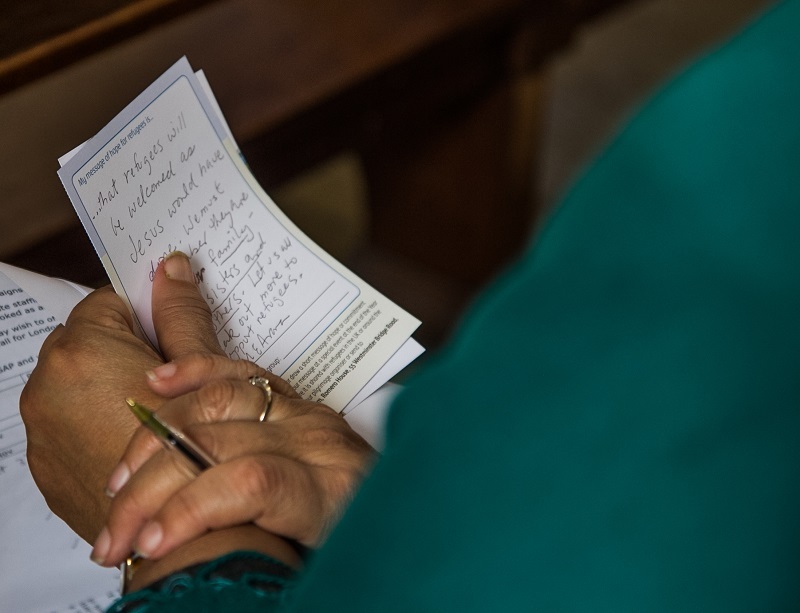 I organised a session in my church where we started with an icebreaker on refugee statistics and also had interactive prayer stations to help people to reflect and think about refugees. The young people found it really striking that more than half of refugees worldwide are under 18 years old. It got us thinking about what it would be like to be in their shoes. My friend told me she was shocked that so many refugees are young, are unaccompanied children, why can’t they sort it out? It’s such a huge problem, there are just so many. 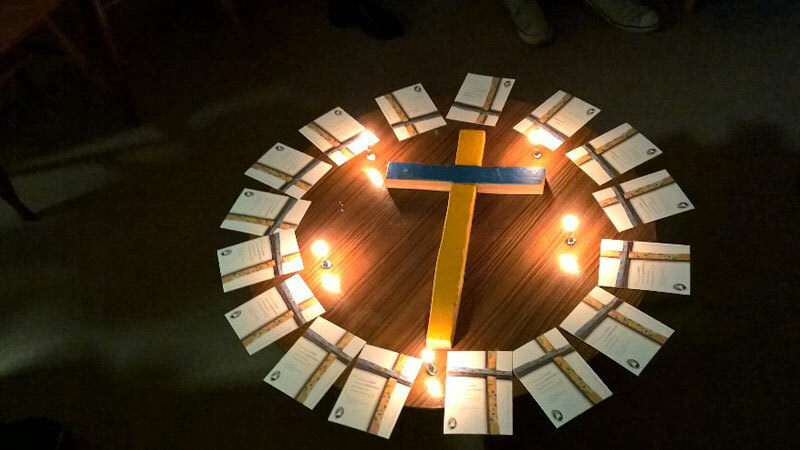 Then we used CAFOD’s Lampedusa cross action cards to write our own messages of hope for refugees. I’ve collected hundreds of these messages, and the numbers are still growing.